Perhaps the Hour+ delay to start the final table was a harbinger of things to come: After 16 hours of play the competitors are still one elimination away from concluding play for the day. I’m sure all of the players had a bad night’s sleep on Friday, and were up early on Saturday full of anticipation. So, it’s quite likely all of the players have been up for over 24 hours –A standard Las Vegas occurrence. 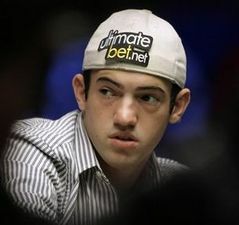 And no one is going to be more unaccustomed to that type of lifestyle than the amateur poker player Darvin Moon. The professional poker players have most likely experienced countless 20+ hour sessions in their time at the tables, so the effects will not be as pronounced as they are with Moon. This entry was posted on Sunday, November 8th, 2009 at 10:59 am and is filed under Poker News. You can follow any responses to this entry through the RSS 2.0 feed. You can leave a response, or trackback from your own site.